The Yes on 23 campaign also hit the airwaves Tuesday in what will probably be a protracted — and expensive — battle for the 21 percent of California voters who’ve told pollsters they’re undecided about the ballot measure. A Field poll released on Sunday found that voters surveyed oppose Prop 23 45 percent to 34 percent. The ads broadcast Tuesday — hours before California gubernatorial candidates Jerry Brown and Meg Whitman were to face off in their first debate – highlight the different tacks the campaigns are taking. The second ad from the alliance of environmentalist, Silicon Valley venture capitalists, and green tech companies also aired statewide in California — and on YouTube, of course — takes a somewhat sunnier tone. 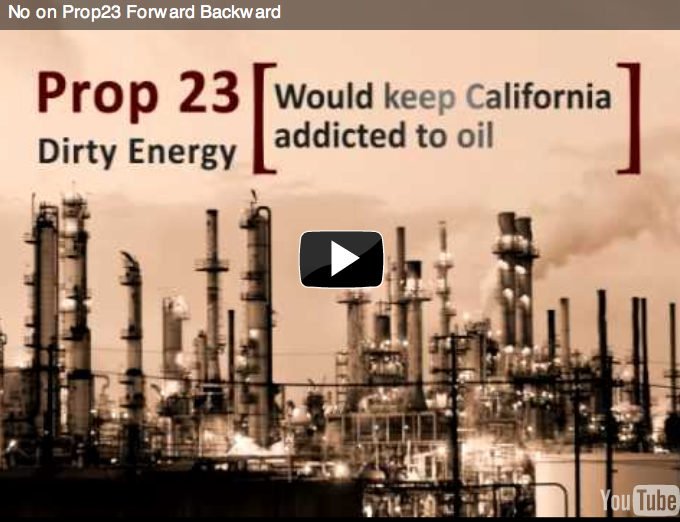 “The Yes on 23 campaign is up with a new television advertisement chock-full of the deceptive claims the oil companies behind the ballot measures have been making for months,” wrote No spokesman Steve Maviglio in an email blasted to reporters Tuesday and which cited various academic studies disputing the Yes claims.